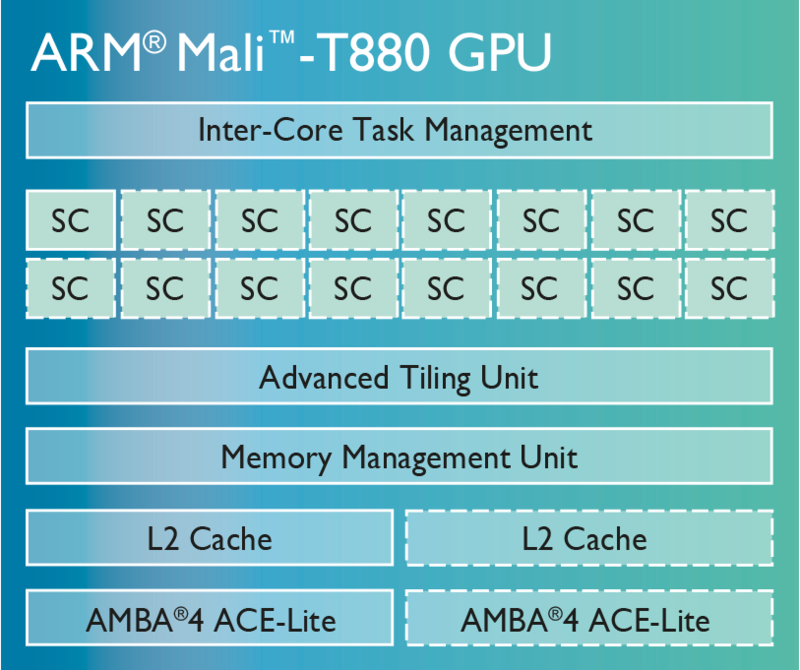 The ARM Mali-T880 MP4 is a mobile graphics solution that can be found in ARM SoCs like the HiSilicon Kirin 950. The chip is available since Q1/2016 and supports OpenGL ES 3.1, OpenCL 1.2 and DirectX 11.2 (FL 11_2). The Mali-T880 can be built with 1 to 16 clusters, where the MP4 version features 4 clusters/cores. The MP4 version that is used in the HiSilicon /Huawei SoC is clocked with up to 900 MHz and performs similar to a Adreno 420 (Snapdragon 805) and PowerVR GX6450 (Apple A8). However, the Mali-T760 MP8 in the Samsung Exynos 7420 pulls ahead thanks to its 8 clusters. Still, the Mali-T880MP4 offers enough power for demanding Android games in Full HD. Thanks to the 16nm process in the Kirin 950, the Mali-T880 can be used in smartphones like the Huawei Mate 8.